Hydroponic gardening is becoming all the rage. Indeed, there are restaurants like New York City’s Bell, Book, and Candle that grow their food from hydroponic beds. What is hydroponic gardening? It is gardening without the use of soil. Instead, nutrients are added to the water which the plant absorbs when getting watered. It is especially important in areas where land is limited. People who live in major metropolitan areas in the United States have a desire to know where their food comes from. So, to create a hydroponic garden yourself, read on! Here are some interesting facts about hydroponic gardening that you might never have known. Good news! This type of gardening is beneficial to a person who has back problems. 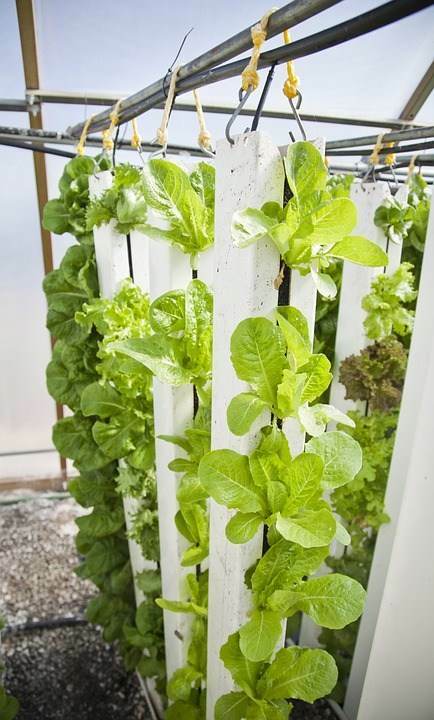 There are a number of ways to create a hydroponic garden that is suited to your height. The first is to have one that sits on top of the water and put the water on stands that keep it raised. 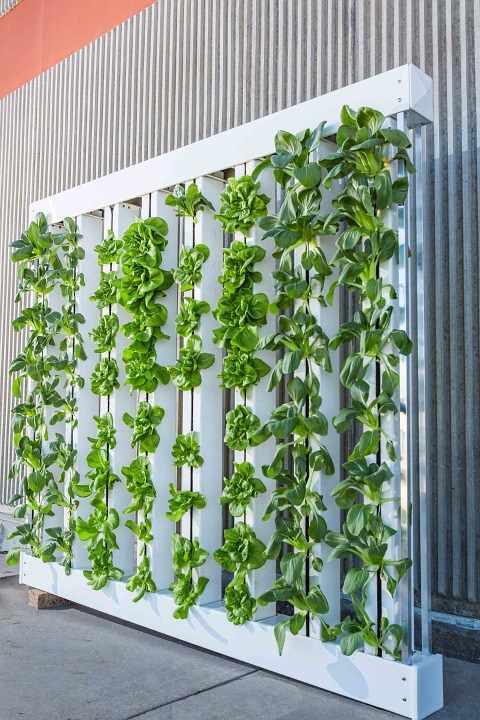 In the picture shown, you can also create a vertical hydroponic system with water that runs throughout the system and the plant grabs the water as it needs it, while the water is passing through. Either way, you are looking at a system that requires much less back bending or squatting than traditionally grown fruits and vegetables. The benefit of having a hydroponic garden is that you can do it virtually anywhere. Hydroponic’s close cousin, aquaponics (where simultaneous fish farming adds nutrients to the water) is used to create vegetables and fruits for the urban community of Dallas. It was so much fun for my girls and me to go there, say hi to the chickens and walk around a three hundred square foot aquaponic garden inside a greenhouse, where I marveled at the fact that these chickens and fish had a better view of downtown than I did. I can just picture a person living in an apartment that only has a small area outside to call their own. They could easily plant a hydroponic garden on their balcony and have fresh fruit similar to that of a countryman’s soil garden. Heck, even those with no outdoor space can garden hydroponically indoors, using the correct facing sunlit entrance window or using indoor plant lights. Expanding on this a little bit, this would be great for a person who wanted to get into farming as a career, even if they lived in a city. Just as the New York City restauranter created his own garden, so can someone else. It is simply a matter of finding a space for rent, say above a shop, and then getting the supplies you need to start your farm. Since no soil is needed it is much easier to create the farm in any location and the added benefit of being close to the people you serve creates many advantages that traditional farmers do not have. One of which is the amount of fossil fuel it takes to get to your target market. I have learned that in my adult age, I much prefer having some sort of control. For example, I make my own coffee using a French press over a traditional coffee pot because I know exactly what temperature the water is when I put it on top of the ground coffee beans. I know the exact time to extract the water from the pitcher in order to make it not too bitter or too weak. In the same respect, you learn originally through reading but then through hands-on trial and error what works and what doesn’t work in the hydroponic garden. While you can do this in a traditional garden, to some extent you don’t have control on what the soil does beneath the surface. When you produce the nutrients in the water, you can decide how little or how much of something you want. Using hydroponics means that many plants will grow in half the time as traditional plants, leaving you with time to grow more plants throughout the season. So long as you keep track of what you are doing, you can shorten the growth time by a little bit more. You become the master gardener and you are in control! I was actually surprised to find out that hydroponics take less water to use than regular gardening. According to Nicole Tyau of Cronkite News, hydroponics uses only a tenth of what regular gardening does. The more I think about it though, this seems accurate. We don’t know how much water is being absorbed by the plant or how much water is being used by other things in the soil so we add as much as we think it needs. The water that is in the flowing hydroponics system stays in it for quite a long time, with each plant only taking the minimum of what it needs. So long as there is some sort of circulation in a stand-alone system, the water within this system will not go bad either and will last equally as long. With the water flowing through the system, it is also creating oxygen for the root system which causes growth stimulation. This helps with the garden’s ability to grow faster. There are a few things that most gardeners detest – bugs and weeds. 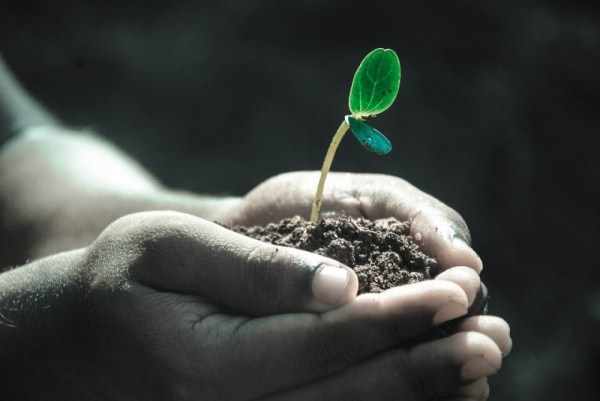 Often bad bugs are in the soil, and by eliminating the soil, you are therefore eliminating some of the problems plants have during their lifespan. This makes it easier on both the plants and you. Likewise, not having to pull out weeds makes everyone involved in the gardening process’s life easier. We can expand on that as well. The fruit or vegetable you are trying to grow is no longer fighting with that weed for nutrients. It is also not having to search for nutrients in the soil and can spend that energy on growing faster. Soil benefits too, at least to some extent. For one, we are not adding pesticides as much because we don’t need them. Another reason that soil benefit from this is because we are not eroding the topsoil in an effort to grow our products faster. While I don’t believe a hobby farmer who has some knowledge of what they are doing and grows more than one variety of crop erodes the soil in the same manner a conventional, “production” style farmer with a mono-crop does, we still do not want to hurt the soil we have left any more than we have to. While soil has its time and place, avoiding the negatives of the soil is definitely a positive in this instance. It can seem a bit daunting to set up a hydroponic farm up from scratch. The idea of a traditional garden is much easier to imagine – simply take a seed, put it in the ground, water it, and wait for it to grow. WIth hydroponics, you have to have a system in place. 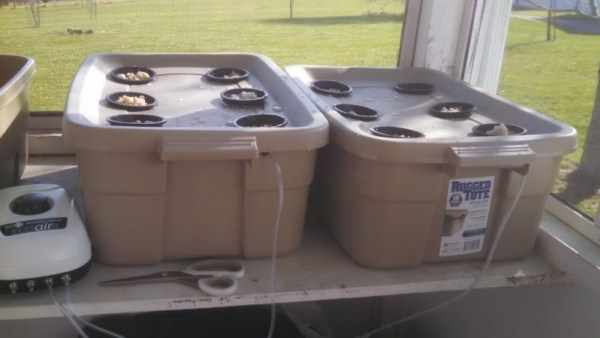 Yet it doesn’t have to cost an arm and a leg, Alyssa over at the Pure Traditions blog shows us how to make a hydroponic system for under a hundred dollars. There are also pre-built hydroponic systems available. 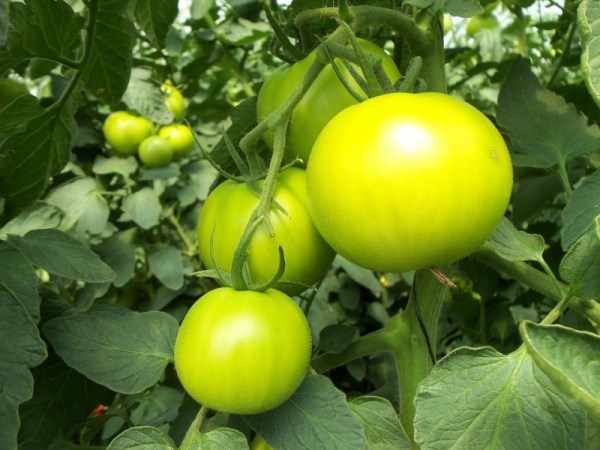 If you consider how much you are currently paying for the fruits and vegetables that you will now be able to harvest, the cost of the purchase will quickly be made up. I am a firm believer in starting small and growing further from there. I have purchased items I thought I would love at yard sales only to find that it just wasn’t for me. With the price of this starter system, you won’t hurt your pockets too much and if you decide it’s not your thing, then you can sell the system for very close to what you paid to get it started. Though I am sure you will not be disappointed. My true claim to fame I think is the fact that it seems weird to me to eat a strawberry when it’s not between the months of April through July. It’s just weird to me to eat a chocolate covered strawberry in February; however, that might change if I had a year-round hydroponic system that grew strawberries. Growing indoors means that in addition to controlling the water and the nutrients you can also control the light (unless you put it in the window) and the temperature in the room that you create your garden in. Dare I say that is almost complete control over your plants and the outcome. Ecohome goes into the system pictured above in more detail, f you like the look of the upside down wine bottles. Some people don’t want a full scale garden year round that they have to tend to. Instead they want a few herbs and spices they can pick as they need. For this person, hydroponics is still a great way to go. 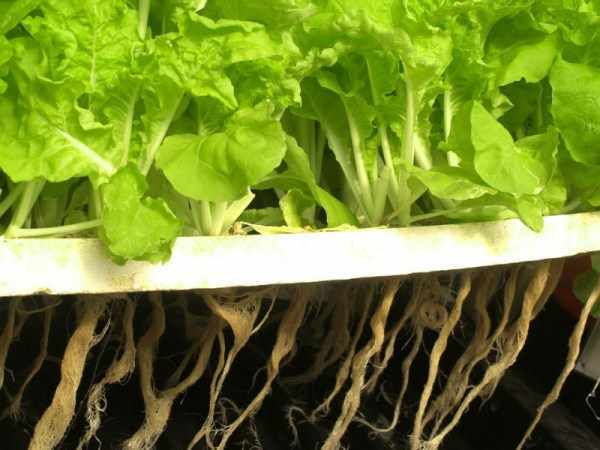 The Macro Garden blog talks about how to create a hydroponic system that is noncircular and small scale but gets the job done. 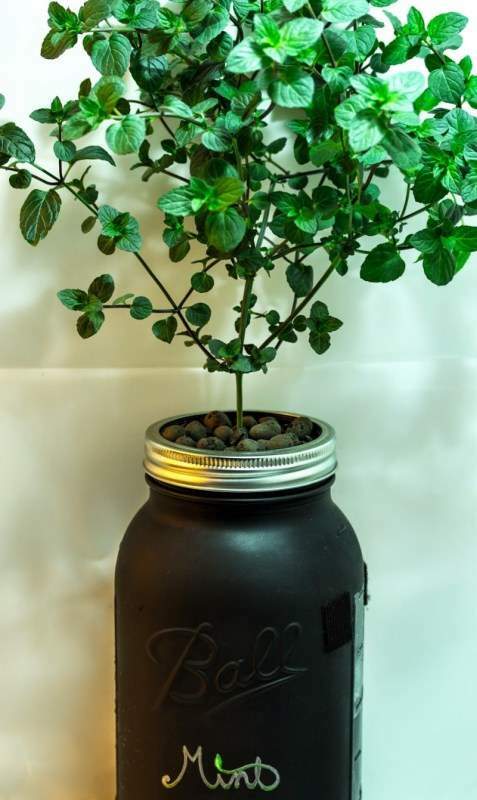 She uses one of the most versitle tools in the house- a mason jar- to make her plants cozy and able to get the nutrients they need. Plus, she adds the paint and chalk marker to the mix to make it that much neater as it sits. It amazes me exactly how much you can grow with a hydroponic system. Modular Hydrodoes a pretty good job of going through this list in detail, but I will give you a short summary here. 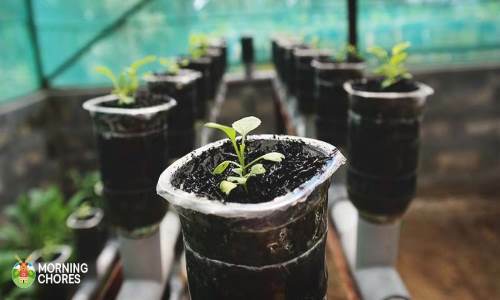 Underground vegetables such as carrots and potatoes can be grown hydroponically with some care, herbs such as basil and mint do well and, under control, can be grown year round in a hydroponic system. 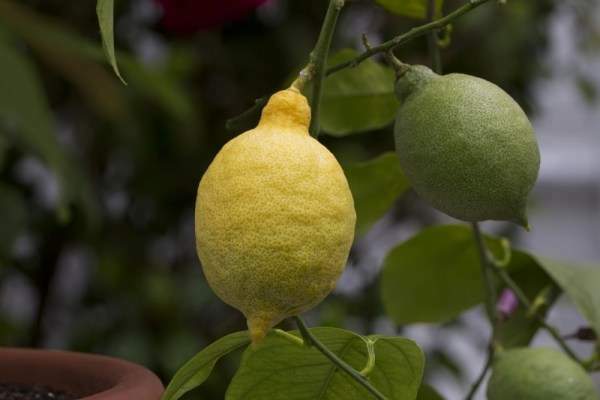 The thing that surprised me the most though was that you can grow blueberries and lemon trees. These are pretty big, heavy plants so the fact that you can create a system that allows you to make some of my favorite foods (who doesn’t love a blueberry lemonade) without the use of soil holding it up is pretty exciting. From the time my kids can remember they were doing two things that are very “grown up”: They were drinking coffee and gardening. Both of these things they still find fun, even as they are entering the teenage stage of their life. Being able to pull up the top of the lid and see the swirling water below as well as the roots that are living within the water is a pretty awesome sight to see and one that kids would love to be involved with. It’s been noted that music stimulates plants, so turn on some music, dance around with your little ones and then garden. Indoors or out, this could be a chore that no one would complain about doing. It’s exciting to be able to grow plants without soil. Being able to do it faster and with a great amount of control on your end will make it run that much smoother, I am sure. 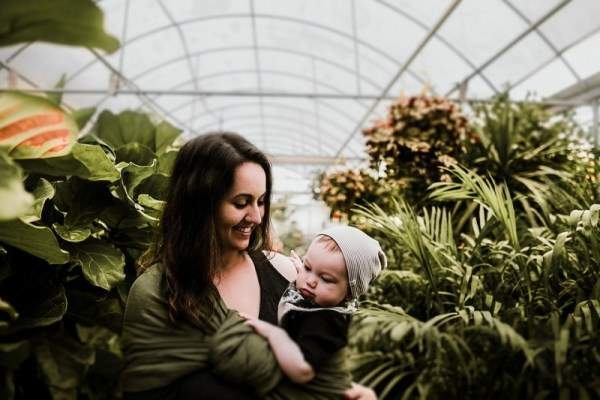 Given the information I have shown you, the vast amount of benefits to starting a garden, no matter if it’s hobby or full time, will help you and your family in years to come have food no matter what is thrown your way. I consider that one for the win.